The world’s largest tidal energy project just took a big step forward as Atlantis Resources announced it has finalized an $83 million funding package for the project to break ground. When it is finished, the 398 MW MeyGen array of underwater turbines will provide clean, sustainable, predictable power for 175,000 homes in Scotland while reducing carbon emissions. 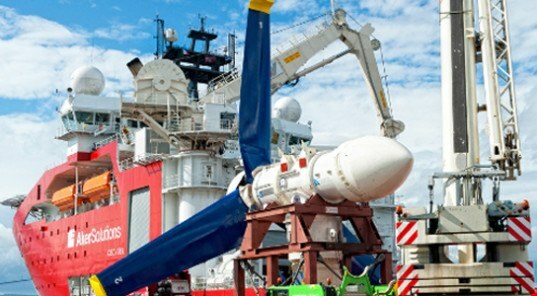 MeyGen’s parent company Atlantis Resources has managed to raise approximately £50 million which will be used to finance the initial stage of the wider MeyGen project, including the installation of four 1.5 megawatt turbines as well as the onshore infrastructure needed to support the project. 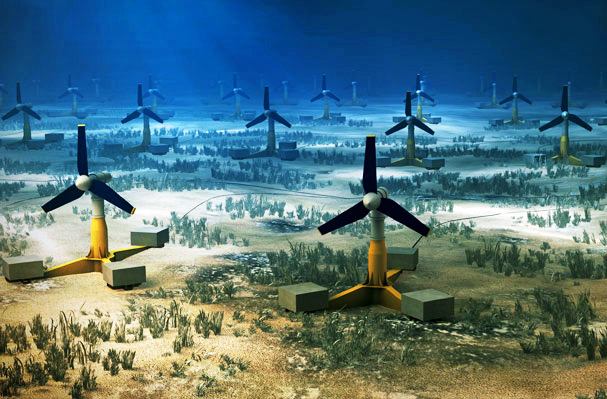 When completed, the project will include up to 269 turbines submerged on the seabed, but the project’s first phase will install 61 turbines that will provide enough electricity for 42,000 homes. Construction is expected to begin later this year, with the first electricity anticipated to be delivered to the grid by 2016. The MeyGen project is the first large-scale tidal project in the world to successfully reach a funding agreement, and it could serve as a catalyst for the global tidal power market by signaling the transition of the industry from demonstration projects to commercial arrays. Congrats to development of a common sense energy market! Bravo to all involved and I think you all deserve to share in the Nobel Peace Prize! I have read that, unlike wind turbines (which kill some birds), these move at a sedate pace, easily dodged by fish. The greater power of the flow of water allows for gearing up to a more useful spin within the unit. Most likely these structures will create habitat and improve and enhance the bio community. Many marine ecosystems are virtual deserts without structure to colonize. That's why reefs are so bio diverse and prolific, coral creates structure. These turbines will create structure. Will these tidal turbines have a negative impact on sea life, like wind turbines do for birds when placed on migratory routes? My concern would be those who are bottom-feeders on the seabed. isnt this going to create a lot of problems to the sea life?? all the life will move away from the beautiful and rich seas that surround scotland, will be many years so they can go back. The world's largest tidal energy project just took a big step forward as Atlantis Resources announced it has finalized an $83 million funding package for the project to break ground. When it is finished, the 398 MW MeyGen array of underwater turbines will provide clean, sustainable, predictable power for 175,000 homes in Scotland while reducing carbon emissions. The turbines could power off 175,000 homes. The project will be the biggest tidal project in the world.